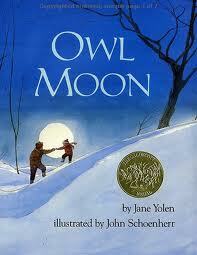 One of my favourite books to read aloud in the cold dark days leading up to winter is Owl Moon, the 1988 Caldecott Medal winner written by Jane Yolen and illustrated by John Schoenherr. This book fits in with our theme of Courage that we are exploring through various picture books but also allowed us to have a wonderful springboard for some gorgeous owl art. A little girl goes owling with her father for the very first time and we, the readers, get to creep along with this pair over hard packed snow illuminated by the moon. We breathe the cold air, feel our own cheeks burn and marvel at the wonderful sound of crying out “Whoo-whoo-who–who-who-whoooo,” and then feeling the silence (heavy and full of wonder) surround us. Yolen’s text is poetic and the illustrations magical. A treat for the senses! When an owl is finally discovered, all of us gasped at the huge wing span and bright yellow eyes depicted in the pictures. A gorgeous book and one I never tire of reading with a class. 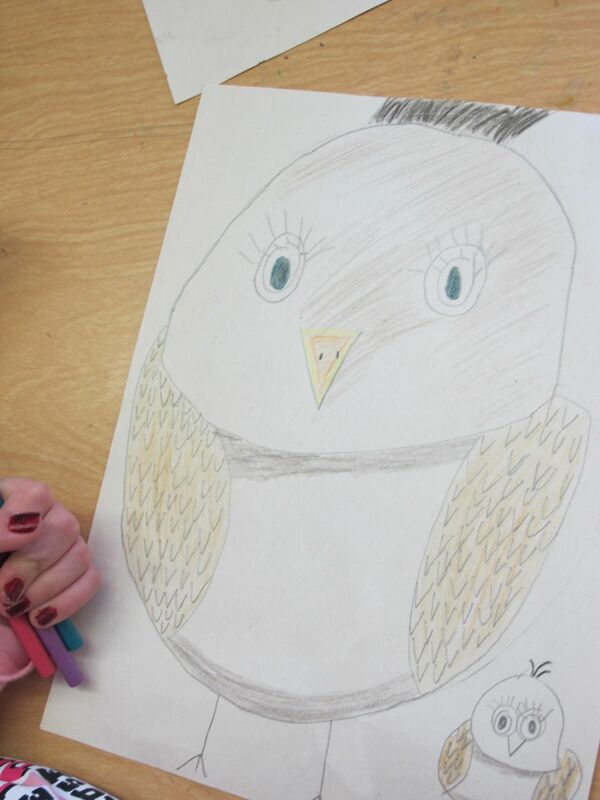 After the story, Ms. Gelson led a mini “how to draw an owl” lesson inspired by this wonderful blog post from Art Lessons for Kids. 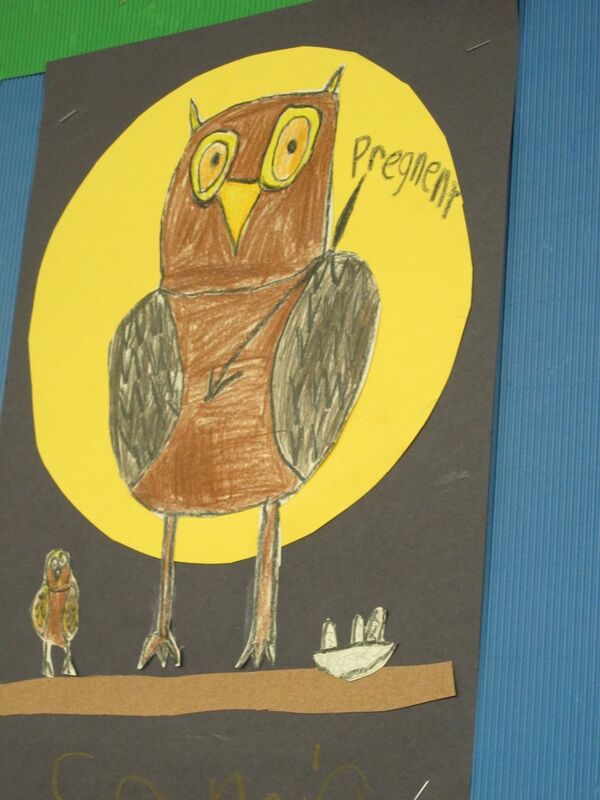 And wow, did students get engaged with making beautiful owl scenes to fill up our room! 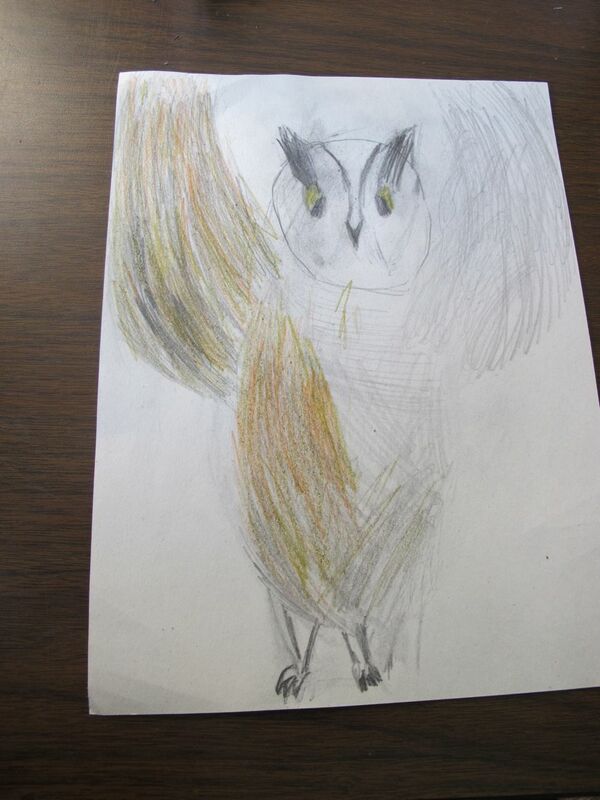 First we drew owls on plain paper and added details and colour. Hailey did a lovely job of filling up her whole page with an adorable looking owl and baby. 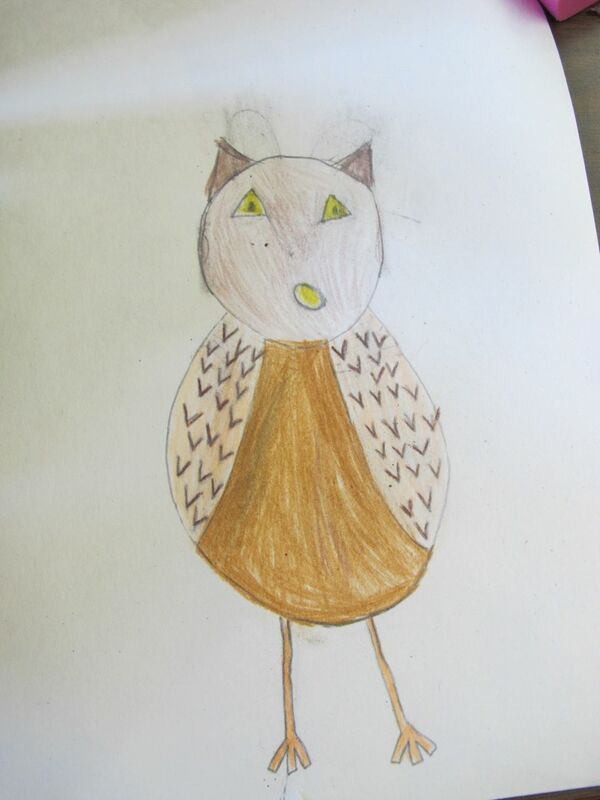 Catriona drew her owl in flight! 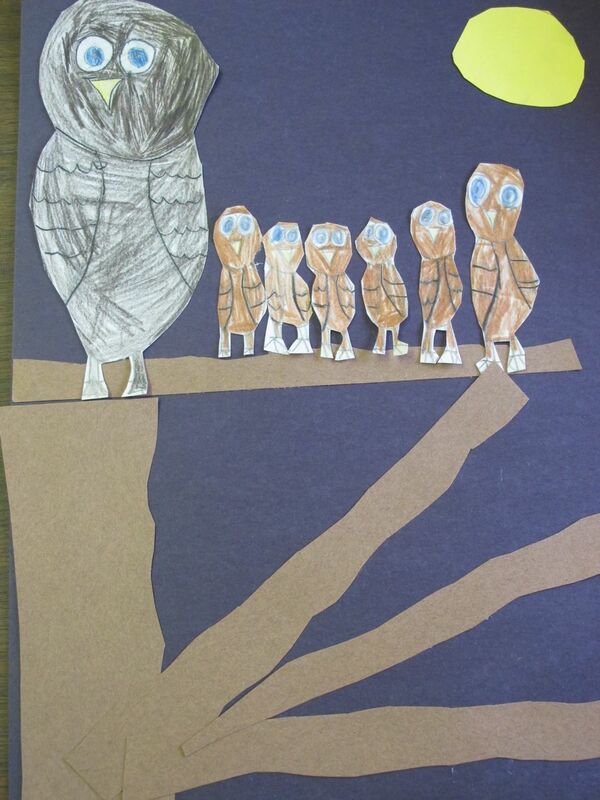 Some owls seemed to be waiting to jump into a picture book as the main character of an exciting story. Purity‘s owl is very dramatic. 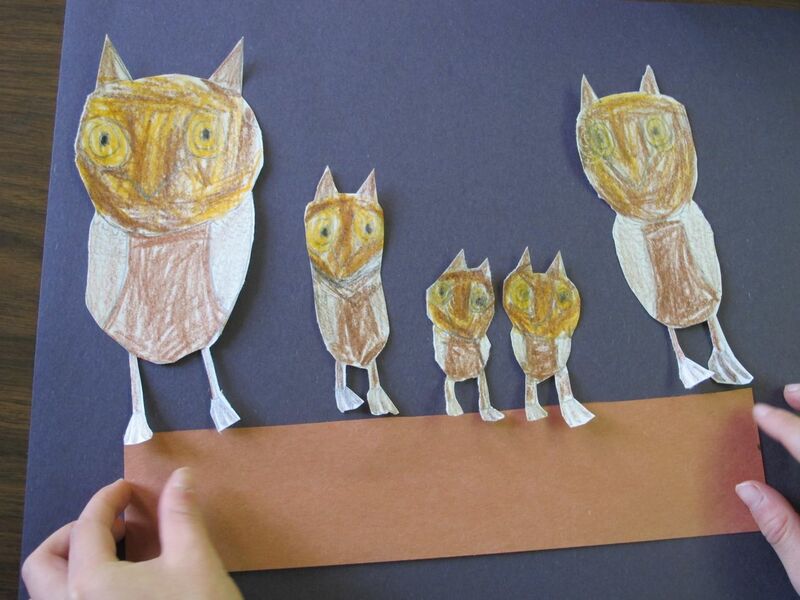 Students then cut out their owl (s) and glued them to black paper making a scene. 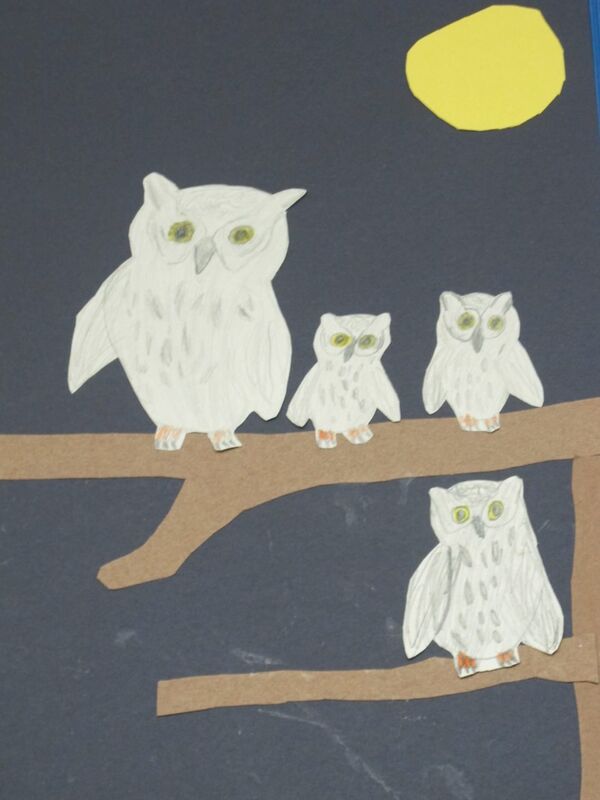 Khai made a whole family of owls perched on a branch. Carefully positioning owls on the page. Truman made lightly grey owls with beautiful ear tufts. Striking against the black background and yellow moon. This entry was posted in Art and tagged art, bird books, Caldecott Medal, courage, favourite illustrators, fiction, great read alouds, Jane Yolen, John Schoenherr, nature, owls, philosophical discussion, picture books by carriegelson. Bookmark the permalink.